I’m a huge fan of mass transit and public transportation and the funding required to keep it up and running. Couple this with the fact that air travel – which I used to love – has become something I now only tolerate when it’s absolutely necessary, and you’ve got someone who was really excited about Ohio’s new passenger rail system. Now that the plans are out there, I could hardly be more disappointed. See, I live in envy of the transportation options of friends and family who live in the New York and Northern Virginia areas. When we visit, I absolutely dig the subways and metro trains and buses. And during the four years I spent commuting 57 miles one-way from North Canton to Cleveland, I would have gladly spent more than the equivalent of my gas money for the option of getting on a train at, say, the Akron-Canton Airport and riding downtown to Tower City. So here’s why the new passenger rail feels like a gut punch: From my admittedly Northeast Ohio-biased perspective, our corner of the state really gets shafted. (To say nothing of Toledo – which is exactly what the new system does.) But more than me taking it personally, the plan essentially ignores a vast portion of the state’s most populous region. Look at the map of the route accompanying that Plain Dealer story. You’re talking six total stops: two each in Cleveland and Cincinnati, one apiece in Dayton and Columbus. The number of stops isn’t really my issue, though – it’s their placement. For example: Dayton and Columbus are 70-some miles apart, but the new passenger rail avoids the shortest route from Columbus to Cincinnati so that Dayton can be on the line. This connects Dayton with both of its bigger neighbors and could, it seems, easily accommodate the schedules of commuters to and from those two larger cities. Hypothetically, Cincinnati and Columbus get to keep their income tax from workers in their limits, while Dayton and its suburbs get to keep their residents and property taxes. Now look at the Northeast corner. The rail runs from Cleveland’s west side down through the largely rural north central part of the state, completely avoiding the populous corridor stretching south along I-77 through Akron and Canton. In other words, anyone south of Cleveland will actually have to drive a fair piece away from Columbus in order to pick up the train that runs to Columbus. Furthermore, a close examination of the state’s geography reveals that an alarming number of people do live south of Cleveland because the city’s northern border is a Great Freaking Lake. Realizing these are the very early days of this project and there is room for develpment and change and schedule tweaking, I just don’t see right now where the regular travelers are for this line. As the Plain Dealer points out, working in one of the Three C’s and living in another isn’t suddenly going to become a viable option. That leaves tourism. And while there is recreation business to be had, given the travel time involved and then the added costs of transportation in and around your destination, I’m not seeing much incentive to take the train when driving I-71 can get you from Columbus to Cincinnati in four hours or so. Who in Youngstown or Canton is going to drive an hour and a half or two hours to the west side of Cleveland so they can get on a train to Columbus? Akronites already have a pretty decent deal, since I-71 runs just to the west of the city thorugh Medina County and offers a straight freeway shot to the state’s capital. So from a practicality standpoint, all of this seems to make the new rail virtually useless to a huge portion of the most populous corner of the state. The whole “if you build it they will come” approach seems foolish to me. Why not put the rail where “they” already are? See that big well-shaded area in the upper right corner right? There are 10 counties there with a population greater than 100,000 according to this map of 2006 population estimates. (And an eleventh, Geauga county, was at 95,676.) How many of these counties are touched by this rail? Two: Lorain and Cuyahoga, which occupy the northwestern-most points of the region. 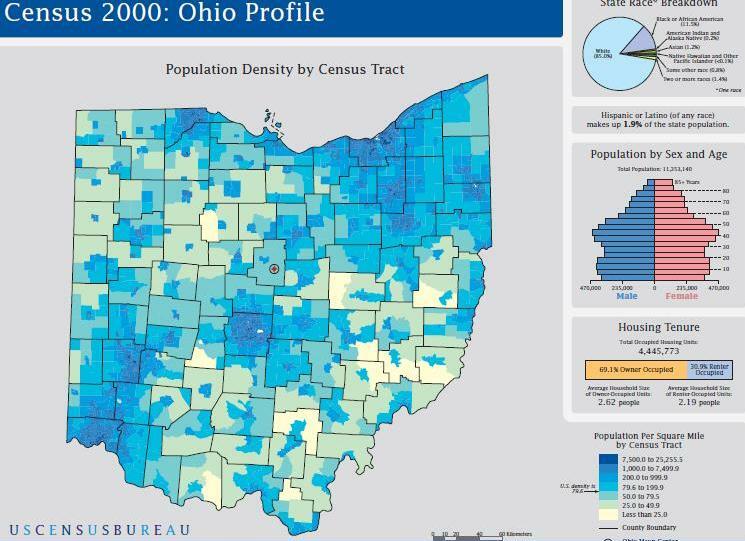 It’s topped by nine Ohio counties with populations greater than 300,000 people. Leading the way, of course, are those which are home to the three C’s: Cuyahoga (Cleveland), Franklin (Columbus) and Hamilton (Cincinnati). Fourth on the list is Summit County, with a population of 545,931 and anchored by Akron – utterly untouched by the new rail line. Fifth is Montgomery County, where you’ll find Dayton, with its own proposed rail stop. Sixth is Lucas County, home to Toledo,which as I’ve noted, falls far outside the plan. In my estimation, though, its situation is different from the Northeast region in that it’s surrounded by a lot of farmland, and no other county in the region has a population above 125,000. (In fact, only two other counties in my 21-county ballparking of Northwest Ohio even reach past the 100,000-person mark. Seventh on the list is Stark County, where I live, and its major city of Canton, which anchors the south end of that I-77 corridor I mentioned earlier. Again – no connection to the new rail system whatsoever. Butler County just north of Cincinnati, and Lorain County, already mentioned, occupy spots eight and nine on the population list, and both are directly touched by the rail. 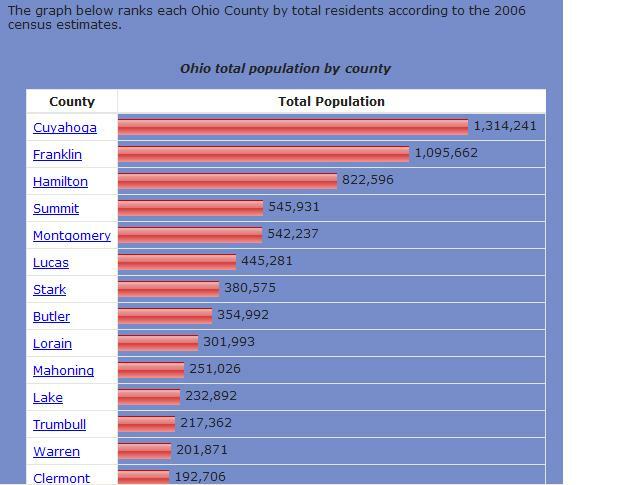 I think it’s also worth noting that counties 10, 11 and 12 on the list are three of the remaining four in Ohio with populations greater than 200,000. They are Mahoning (Youngstown), Trumbull (Warren) and Lake counties, all three of them in the northeast, and once more, all untouched by the new rail. Number 13? Warren County, right along the Dayton-Cincinnati route. While some say this project isn’t about commuters, that’s fine, but then don’t tell me it’s about getting congestion off the freeways, because I think those are two totally different things to address. The thing is, for all of these doubts, I really want this to succeed. I want it to draw passengers and bring in cash so maybe it can be expanded and hey, maybe even spark the development of high-speed rail. I want it to lead to a day when I can go visit my Columbus and Cincinnati friends by train and be back to work on Monday, or maybe a day when my brothers and I can go catch a Browns game without driving out of our own county. In other words, I desperately want to be wrong about all of this. But right now, I just don’t see these rails leading to any of those destinations. Allow me to talk you off the ledge. What you ought to know is that…..
> The direct rail line between Cincinnati and Columbus is only 8 miles shorter than the Dayton route, which was historically the main passenger rail route between those cities. It doesn’t make sense to miss Greater Dayton’s 1 million people by saving 8 miles, not when the biggest cities on the direct route are Wilmington and Washington CH. Plus, the Dayton corridor’s alignment, including curvature, was engineered to accommodate trains traveling at 100 mph decades ago. The direct route was never a mainline and would need substantial realignment and property acquisition just to bring sections of it up to 70 mph. The direct route’s costs were so high, the distance not much shorter and the population so much less that it was immediately discarded from further consideration by consultant Parsons Brinckerhoff, one of the world’s largest and most respected engineering firms. > Conversely, the writer takes the exact opposite view of the Akron route, which would have added more than 50 miles, 1 hour of travel time and more than $100 million to the start-up cost of 3C corridor service. Yet he supports doing that while opposing the 8 added miles of the Dayton route? > Plus, the train schedules that were put out there are rough drafts which Amtrak developed for planning purposes. As with other states, the first draft of schedules are very conservative and very different than what ultimately gets issued for service startup. And they are continually refined as operating crews, dispatchers and others become accustomed to where the fat in the schedule is. The schedules invariably get tightened up and further refined with experience. > This is not a commuter service. Whoever says it is doesn’t understand its distinction with intercity rail. There is urban rail transit (0-20 miles), regional/commuter rail (15-100 miles) and intercity rail (50+ miles). Each has their roles, limitations and benefits. Intercity rail is developed not to remove cars from the road but to increase commerce, metropolitan connectivity, promote economic development around stations and enhance mobility. On that score, this and other projects in North Carolina, Oregon, Missouri, Oklahoma and elsewhere are doing just that, and are doing it well. > Patience is required. No intercity train service operating today looked like it does now when it first started. In fact, most looked just like the 3C startup service. They were nurtured and advanced by their state sponsor(s). I know we want faster, more frequent services, serving more cities on 3C, but we also want services to other parts of Ohio. Starting this year (probably by summer), the Ohio Hub environmental impact studies will begin for developing passenger rail up to 110 mph on five corridors/sections: Cleveland – Toledo, Toledo – Columbus, Cleveland – Pittsburgh, Cleveland – Columbus, Columbus – Cincinnati. When those studies are complete, ODOT will be able to submit applications for federal funding to implement plans for passenger rail on each corridor. As with the 3C “Quick Start” plan, what we want will depend on what the plans, public input, political issues, funding availability and other issues beyond our control will allow us to do. Often those realities are quite different from our own ideals. But that doesn’t mean we should give up, walk away or trash what has been achieved. Nor should it mean we should be satisfied or content. It does mean we are one more important step closer to our goals.